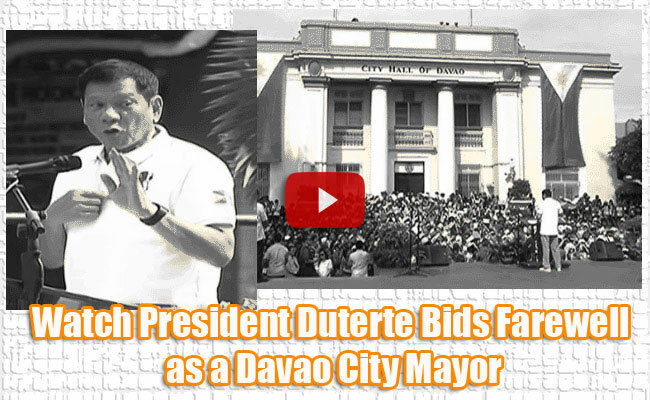 On his last term as a mayor of Davao City, Incoming president Rodrigo Duterte had a farewell message to the people of city when he attended a flag raising ceremony at the ground of its city hall last June 27.On his speech, he reiterated that he will be harsh among criminals but caring for those in need. He also insisted that he will do all his promises to the people during his election campaign. The main goals of his program are to diminished criminality and corruption in the country. Duterte then vowed that his government is for those who are helpless and defenseless. These words were borrowed from his late dad and former governor Vicente Duterte. He mentioned some of the government employees from Bureau of Customs and Bureau of Internal Revenue to stop its corruption. The incoming president promised to reform the government especially the Department of Foreign Affairs and regulatory commissions to improve their system in passports, license, and permit because he hates seeing people in a long queue. Aside from lessening corruption, he also talked about his law about curfew and liquor ban. Some may criticize this campaign but Duterte said that these are people who don’t understand this law and this is just for the protection of children. This will implement in the country once he officially become the president of the country while he is still deciding whether he will still set the 1 am liquor ban. These hobbies must minimize because it’s not good for the children and the country. Duterte will also continue to conduct death penalty to stopped speculations that he is discouraging the commission of crimes. He stated that he follows the classical theory where it states that you must pay what you have done but some are in positivists theory where the criminals will still be saved. In the past, the death penalty in the country was not implemented because it did not reached its main objective.